Home Buyer Fatigue or Housing Derangement Syndrome? Although home prices remain strong, the volume of home sales has dropped off during June. This is causing some in the media to exhibit “housing derangement syndrome” by reporting a pending housing collapse. However, there is a more sensible answer and that may be “home buyer fatigue.” Buyer fatigue is not solely used in real estate, rather it’s a term to describe consumers who do not engage in a market sector for a short duration for various reasons. Home buyer fatigue has occurred multiple times since 2013 after a period of sustained home price increases. 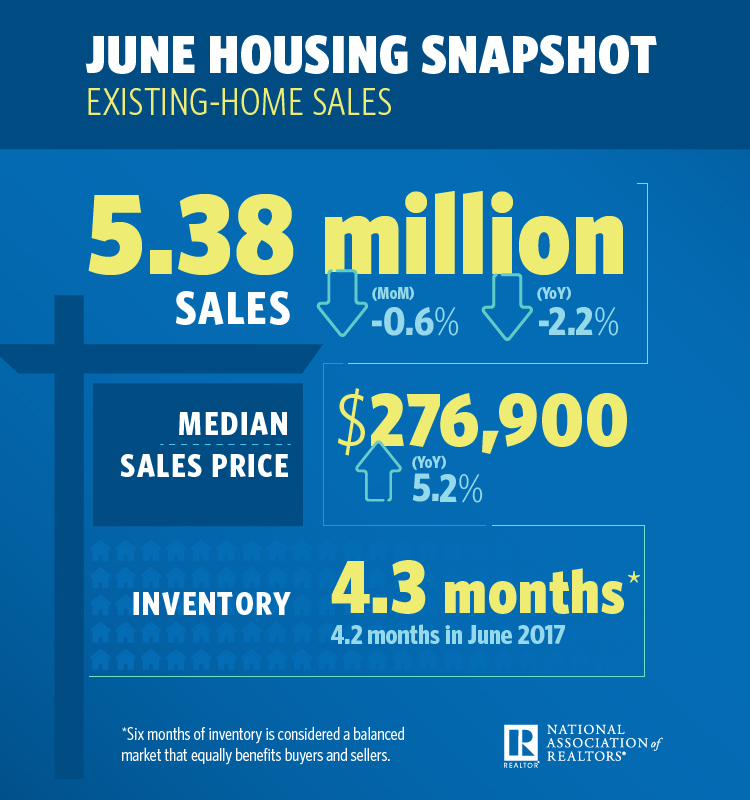 The National Association Realtors (nar.realtor) reported in a July 23rd press release that the total existing home sales for June decreased 0.6 percent, and is down 2.2 percent from the same time last year. Home sales in Montgomery County have also been retreating. The Greater Capital Area Association of Realtors (gcaar.com) reported sales declines for single-family and condos during June (-3.4 percent and -13.9 percent respectively). Year-to-date sales are also below last year’s transactions for the same time period. Although national home prices are increasing, the gains remain steady. The latest S&P CoreLogic Case-Shiller U.S. National Home Price NSA Index reported on July 31st (spice-indices.com) indicated a 6.4 percent annual gain during May, which is the same as the previous month. However, the 20 City Index showed a slight decline to 6.5 percent (from 6.7 percent). Seattle, Las Vegas and San Francisco continue to lead the nation with double digit gains (13.6, 12.6 and 10.9 percent respectively). The Washington DC region, however, showed a modest annual home price growth of 3.06 percent. As home sales decline, many contribute home buyer fatigue to increasing home prices and mortgage interest rates. A few have already begun to ring the warning bells of bubble popping home price deflation citing Seattle and San Francisco’s housing woes. However, those exhibiting housing derangement syndrome need to take a deep breath and look at the facts. Most of the country’s home values are increasing at a sustainable rate. Additionally, contrary to reports of inventory surpluses, home sale inventory continues to be low in most of the country (Montgomery County single-family and condo listings are below last year’s level by -9.3 and -12.8 percent respectively). It’s also important to look deeper into what may be driving those overheated housing markets to experience the sharp price spikes and recent sale declines. For example, Seattle’s housing juggernaut may be tied to Amazon’s nine years of a seemingly hiring frenzy. According to reporting by Matt Day for The Seattle Times (Amazon’s employee count declines for first time since 2009; seattletimes.com; April 26, 2018), Amazon begun corporate layoffs, as well as a possible hiring freeze, earlier this year.